A bit early for Halloween, but I finished my costume! Over on the productivity-as-RPG site Habitica, there is a challenge to dress like one's avatar for Halloween. You've already seen the hat, but I needed to crochet a knob for the end of my mage's staff in order to complete the outfit. I've used a bit of photoshoppery to add in the wolf. The only toy wolf I possess is about 4 inches tall! 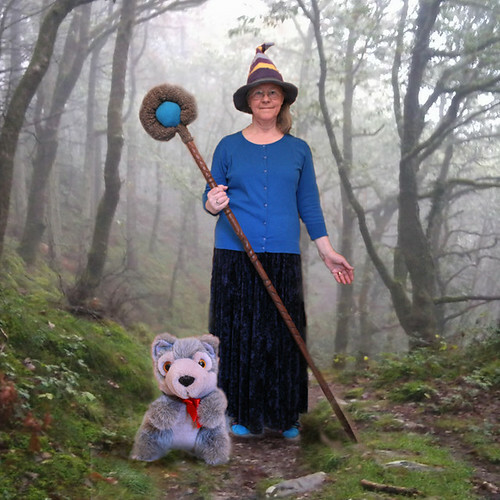 Then I've used rather more photoshoppery to place us in a misty forest. Oh you look wonderful. What a shame Halloween cards aren't a thing! Your hat sounds splendid. I do hope it turns up in time to wear for Halloween. Re losing things, I have lost a blanket. It started getting chilly the other week, but could I find the extra blanket? No, I couldn't. I remember washing it last spring when it turned warmer, but I can't remember where I've put it and there aren't that many places to look. It is a complete mystery. I love both your avatar and your recreation of it.